Winter is in full swing and has brought us sun, snow, ice, sub-zero temperatures, and rain! 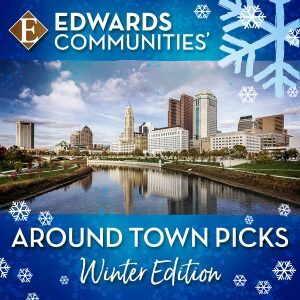 Our climate may be inconsistent, but one thing that remains the same is the wide variety of activities and fun events offered around our city! Based on Ron Chernow’s biography of Founding Father Alexander Hamilton, Hamilton tells the story of becoming George Washington’s right hand man during the Revolutionary War and the nation’s first Treasury Secretary. Hamilton entertains with hip-hop, jazz, blues, rap, R&B and Broadway. Learn more and get your tickets here. Our Columbus Blue Jackets have eight home games this month against the St. Louis Blues, Washington Capitals, New York Islanders, Tampa Bay Lightning, San Jose Sharks, Pittsburg Penguins, and Philadelphia Flyers. Visit their website for the full schedule and to buy tickets! Got a sweet tooth? Then join Columbus Underground for their 4thannual Sweet Treats Dessert Festival, featuring samples from Columbus’ best treat makers! Your ticket gets you access to the full event with samples from each vendor. Early bird tickets are available for both the 12 p.m. – 2 p.m. and 2 p.m. – 4 p.m. sessions. A portion of the ticket sales will benefit the Gifts of Kindness Fund. Visit their Eventbrite sight for more information. The 9thannual Columbus Winter Beerfest celebrates craft beer from down the street and around the country! Thousands of craft beer fans can sample hundreds of craft beers from over 130 breweries while enjoying live music and appetizer bites. Get your tickets today. This is pop icon Cher’s seventh solo concert tour in support of her 26thstudio album, Dancing Queen. She is expected to perform her biggest hits as well. Get your tickets here. Celebrate the Valentine’s Day holiday with delicious wine, chocolate pairings, live music and orchid displays under the stars. Learn more. The fourth annual First Responder Face-Off pits the Columbus Fire Department against the Columbus Police Department for their annual rivalry on ice! The winning team earns the Buckeye Cup trophy and bragging rights for the whole year. Proceeds from the game benefit Hockey Helping Heroes, which supports central Ohio first responders and their families. One of the American Lung Association’s signature fundraising events, the Fight For Air Climb gives you the opportunity to race the stairs of Columbus’ tallest building! With 40 floors and 880 steps, the Rhodes Tower is the site for the Columbus Fight for Air Climb. Every step counts, so climb with your family, your company or individually. The event has raised more than $53 million to the American Lung Association. Participants who hear their name called can “Come on Down!” to play classic games just like on The Price is Right TV show, one of the longest running and most popular game shows! Games like Plinko, Cliffhangers, The Big Wheel and even the fabulous showcases gives eligible individuals a chance to win appliances, vacations or a new car! Learn more and purchase your tickets here. The largest multi-sport event in the world, the 2019 Arnold Sports Festival is estimated to attract 22,000 athletes from 60 nations to compete in 80 sports. Professional bodybuilding and strongman competitions with the most well built and strongest athletes in the world will be headlining the festival. Learn more and purchase tickets here. These are just a few of the fun events offered in February in our exciting city! You can learn about other events by visiting local websites such as Experience Columbus and Columbus Underground.